Well this all started when my company transferred me to Missouri from Georgia in 2008. For the first two years I hunted public ground to no avail. I grew tired of getting up early, just to run into other hunters and little or no game. I found it difficult to find and obtain permission to hunt on private land. I learned about HSP from another clubs meeting, and was thinking this must be too good to be true. For the next several months I researched HSP and learned more about the club. Still thinking this is too good to be true. I thought there has got to be a catch. But after long consideration I joined HSP on September 15, 2010. I was on HSP ground the next day. After many patient conversations with Angie, I got the hang of the system. Still a little skeptical, I began hunting and scouting land close to my house. I hunted mostly during the week, and never had a problem reserving the farms I wanted. That all change when my shift changed, and I could only hunt weekends. On Friday, October 15, I went online to reserve the farm I had been hunting. "Someone else had it reserved!" (little did I know what a blessing this would be) I was a little disappointed to say the least. This forced me to reserve another farm. I scouted the farm on October 16. I saw so much sign and promise. I drove 45 minutes home, got my climber, drove back and hung it! On Monday the 18th of October, I arrived with much anticipation but saw nothing. I went back on Wednesday the 20th "for one of the greatest days of my hunting career!" A little after daylight I saw a spike out in the CRP field and thought cool, I've seen a deer. A few minutes later what I thought was a good 8 pointer (moving here from Georgia, body mass verses antlers are very different) came busting across the creek I was hunting on, but gave no shot. He went out into the CRP, and began sparing with the small spike. I tried bleating, grunting, wheezing and anything I could do to get his attention, all to no avail. He heard nothing due to the interstate less than a quarter mile away. After what seemed like an hour he began to make his way back into the creek bottom, horning a tree on the way. At first he was headed away from me but unexpectedly he dropped down into the creek bed and headed my way! 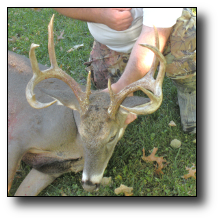 Praise God he stopped at about 25yards with only his vitals showing through a small hole in the brush. The two blade rage found the pump house and he took off, thank God towards the truck. He went out of site but I could see some small trees thrashing around. I thought to myself he's either going to be down, or he's really mad. After the longest 45minutes of my life, shaking the leaves off the trees, I climbed down and retrieved my arrow covered in awesome blood. 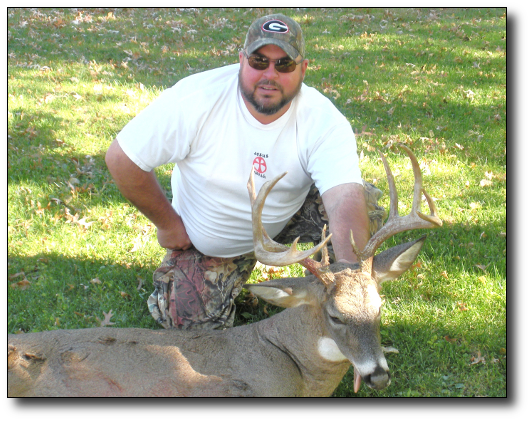 A short time later I was standing over a 200 pound plus, ten point Whitetail! The biggest deer I had ever seen in the woods, much less killed. Then the work began. Two hours later he was in the truck and his way to the camera, and then the freezer. I am so thankful someone had the farm I intended to hunt. That got me out of my normal territory and expanded my range. Thanks so much to Angie for being patient with all my questions. Thanks to HSP for great land and great people. And a special thanks for the member who reserved that other farm. I have no desire to go public again. You might think this all sounds too good to be true... but it's not!!!! Click Here to contact HSP!